Private and exclusive pool and garden. Sleeps 12. 5 Bedrooms. 4 Baths. Florence city centre is at just 10 minutes by public bus! You will not need a car to enjoy the city and Villa Acacia. If you have ever been to Florence you know this is a town where “suburbs” takes on a very special meaning. Just outside the very hectic "circonvallazioni", the main arteries that lead into and out of the city center, are a host of picturesque residential areas where the aristocratic and wealthy built their spacious villas in the shade of huge umbrella pines. Cypress trees line the narrow roads that wind upwards past olive groves and tiny vineyards, so that almost at once you forget about the noisy city you just left behind. But it’s there, visible from every curve and terrace, dominated by Brunelleschi’s inexplicable cupola and the forboding tower of Palazzo Vecchio. What a perfect combination, to have the sights of the Renaissance city but not the smells, sounds and mayhem of 21st century Firenze! This 17th century villa occupies a hillside on the old road to Bologna, just fifteen minutes north of the city center. It has its own 4500 square foot garden, with a swimming pool that occupies one of the natural terraces where lemon trees used to be cultivated in a great earthenware vases. Facing this side of the property is the glass-enclosed room where those trees were protected in winter; now it holds a table where six people can dine with a view of the Duomo. At the other end of the garden is a cottage with a washing machine, dryer, iron and board, and a small WC. Also occupying the ground floor of the villa are a comfortable sitting room with couches, chairs and satellite TV, a dining room whose table can open up to accommodate sixteen people, a living room with a fireplace, armchairs and telephone. These rooms have stunning casement ceilings. Next to the dining room is a kitchen, furnished with a full fridge and freezer, oven, range top, microwave, Nespresso machine, American coffeemaker, and dishwasher. It has a table for two, and opens onto a covered pergola with dining for the entire group. Upstairs, the spacious master bedroom has a double bed, a roomy wardrobe and a door onto a private terrace overlooking the city. Next door is a bathroom with shower and tub. Across the hall from the bathroom, a door opens onto a tiny back street, perfect for unloading bags and parking if you have more than one car. The next two bedrooms share a balcony: one has two twin beds, the second has a full sized bed and a single bed. Then there is a suite with its own entrance, featuring a double bedroom, small kitchen and bathroom with shower. Another flight of stairs leads up to the last bedroom, which has a double bed and a bathroom with a stall shower. But the villa has more to offer! On the roof, reached by a comfortable flight of stairs, is a large terrace with deck chairs and one of the best views to be found for miles. All the windows in the house have screens, the property is gated and surrounded by a wall, and in the garden is a built-in brick barbeque. Just down the street are several small shops and only 100 yards from the door is the stop for the city bus that goes straight down to the center of town (Piazza San Marco, the bus runs about every 10 minutes and the trip Villa-San Marco takes 10-15 minutes). Hello I am Lorenzo, I am an open minded person, I like to travel, care about honesty and environment. I care about the Villa and its guests. If you need help for a tailor made vacation... ask me! I gained professional skills in the marketing and trade marketing departments of multinational firms, fast moving consumer goods segment. Good interpersonal skills, creativity, strong interest in commercial policy, continuous struggle for innovation, optimization and growth and the attention to return on investment are some of my strengths. The analysis of opportunities and risks related to the choice of becoming an entrepreneur brought me to “invent” a service which until now was not offered, although desired by many: the management of their real estate investments through a complete knowledge of legal affairs, an operative efficiency and a careful analysis on available data. Managing touristic lease is the best part of my job, as I often come to know fascinating clients and at the end of their stay we have each other a new international friend. A spacious Villa, a large private and fenced garden, a pool with a sundeck surrounded by a unique landscape and view over Florence and the Duomo, a vacation where a car will not be necessary. On the hills, just 15 minutes away from the center of Florence One step away from downtown Florence, on a vantage point in the hills of Florence immersed in their 400 years of history. Discover where Villa Acacia is. Ideal for families with kids A safe and spacious enclosed garden for playtime, a kid-friendly pool; relaxation and freedom for parents as well as children. Ideal as a group getaway 3,900 square feet (365 square meters) of interior to accommodate 10/12 people, spacious rooms and a never ending view over Florence for guaranteed comfort even in large numbers. Ideal for family reunions and private weddings Situated on the hills of Florence, just 15 minutes from the city center, the airport and the train station (Even without car). Lot of room on the public road nearby the entrance. Sofas, armchairs (up to 10 seats), Chromecast TV, Stereo..
1,5 meter depp, 8x4 meters. By the beautiful wooden sundeck with view. We were 4 families, total of 12 spending Thanksgiving in Florence. The entire experience from start to finish was outstanding. Lorenzo was very quick to answer questions throughout the entire booking process. His concierge contact, Andrea, was very helpful is booking a private group trip to Siena and a wine tasting in Chianti. The views from the villa are exquisite, the rooms are all a good size and our group fit perfectly. The walk to the bus stop was very quick making it very easy to get into Florence without the worry of a car. Lorenzo also arranged a 4-course Italian dinner for all of us which was an incredible experience. We loved this villa and hope to be back soon!! We had a large group of friends and family join us in Florence for a week in celebration of a 60th birthday. 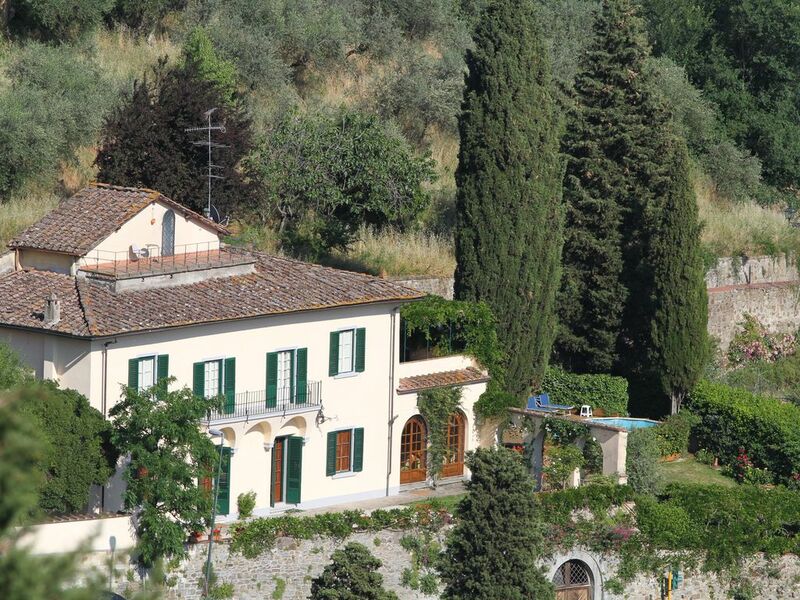 The villa was perfect as it provided the perfect location, stunning views of Florence, bedrooms and bathrooms for all as well as a much appreciated pool as a reprieve from the heat! The location in the beautiful and quiet La Lastra neighborhood also allowed us to escape the intense number of tourists in the city centre! We followed Lorenzo's advise and returned our rental car as the bus into and out of the centre of Florence was both convenient and inexpensive. The outdoor wood burning/charcoal BBQ was a special treat as we were able to grill our own Florentine steak, eggplants , zucchini and onions. The service and attention provided by Mario was also very much appreciated. He made himself available at all hours! It was our first visit to Florence and it is a magical city. Lorenzo's villa allowed us to be more then visitors. We will return! Good location if planning on frequent visits into Florence. The # 25 bus runs every 20min with pick up about 5 min walk from villa and drop off at San Marco whcih is easy walk to all sites. Car parking is on street but was always available. The villa itself is old but charming. Furniture could use some updating but beds comfortable and bedroom AC worked well. Had an electrical glitch day one but Mario and Lorenzo were attentive and quick to respond and resolve issue. House itself does not lock up well but surrounded by high stone wall and electronic iron gate, overall felt safe. Mario serves as concierge, always answered cell phone and spoke good english. Driving to and from the villa for day trips to the west and south was a bit challenging and forces you through a busy area of the north side of Florence. Would suggest that if your trip itinerary was primarily to see the hill towns/chianti region would choose villa south of Florence. However, if focusing on Florence itself it is an ideal location. Tabacchi and alimentaria about 10 min walk with all the basics but not much else within walking distance. Fiesoli has a lot to offer as far as restaurants and trattorias but does require 10-15 min easy drive. Good washer and dryer. Plenty of bathrooms. Showers are about as good as you get in Italy. Total of 9 of us/ 2 families and plenty of room to spread out and relax for both kids and adults. Outside pool/seating/terraces were comfortable with great views. What can I say? Spending Christmas in Florence is magical. And staying at this home made it even better. We were able to even take advantage of a Christmas Eve dinner catered by Andrea and his family. Lorenzo is a gracious and honest host who was able to help with whatever we needed. I would recommend this villa to anyone and would love to visit again in the summer. An amazing home with everything you would need and then some. Lorenzo could not be nicer and more accommodating. Every day was perfect. The seated dinner for 16 that we had in the house was exquisit. The wines and chef cooked meal in the villa were all over the top. I cannot wait to go back!! Perfect oasis for anyone with appreciation for beauty (and convenience)! We stayed at the villa as ten adult friends on a cycling vacation. wow! Gorgeous location but peaceful and away from the city fuss. want the fuss? no problem....hop on the bus practically out your front door and you are in city center in 10 minutes. The views are outstanding, the house decor interesting (we used the firepit twice but still too cold for the pool) and Lorenzo is a caring and considerate host. We have stayed in this are several times in several different villas and love the proximity to the history scenery and restaurants of Fiesole. Next time we come, we come back here! Ask about our free high quality concierge service! Eventual usage of air conditioning and Heating is not included and based upon usage, but it is granted not to be over 300 Euro per week. Not included in the price is the city tax, due in cash upon check in. 2,5 Euro per day per declared host until the seventh day: longer stays pay just the same as for 7 days. At check in a damage deposit of 500 Euro is requested. To be refund upon check out. Rates are subject to chance until reservation is confirmed.